The 30-metre long Mantra features teak decks with white sails reminding the seafaring heritage of Indonesia. Mantra sailing yacht is a modern version of a traditional wooden phinisi used for spice trading all over Indonesia. Mantra combines ancestral Indonesian boat building techniques with modern marine technologies resulting in a exclusively comfortable yacht.Designed by Italian architect with modern and cozy interior and filled by state of the art technology, Mantra is made to explore remote islands with up to 10 passengers aboard. 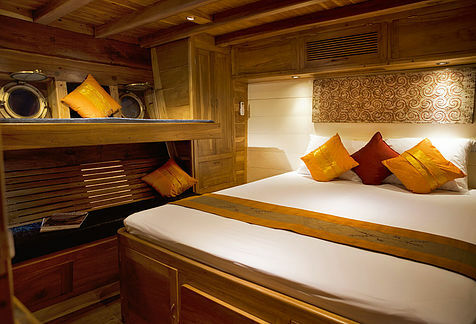 Mantra has 3 spacious cabins featuring queen-sized beds, Indonesian decoration touches, wardrobes, air-conditioning, en-suite bathrooms with hot water showers. One cabin is fitted with one bunk bed and it is possible to add two other single bed in the other cabins so that Mantra can comfortably accommodate from 6 to 10 passengers. Mantra is perfect for families traveling with children or group of friends. Onboard Mantra, a crew of 6 is here to make your cruise the best you have ever had. An experienced captain, english speaking cruise director and dive master and 4 housekeepers will remain at your disposal to fulfill all your needs. Mantra interior is made entirely out of teak wood giving it a very oldschool and traditional style. A lounge, library and indoor dining area will welcome you after your dives or adventurous day unless you prefer to relax on its main deck where loungers and beanbags will be your best friends. At the stern the outdoor dining area is the perfect place to admire Komodo’s famous sunset and drink wonderful cocktails prepared by your amazing chef.